・ A single microphone body with two cardioid condenser capsules that can be rotated freely up to 180 degree in 15 degree detent. 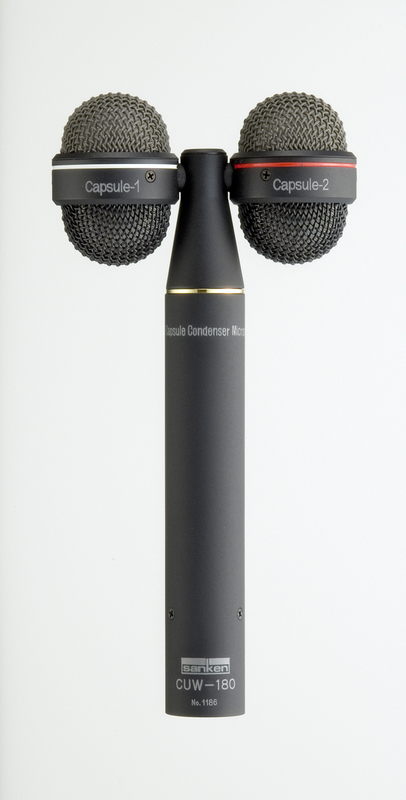 The CUW-180 combines two exceptionally engineered cardioid condenser microphones in one compact body. Each of the two capsules is independently adjustable through any angle up to 180°, with 15° detent, providing a versatile microphone for a variety of X-Y stereo and Surround recording applications. Thanks to precise diaphragm layout of two capsules, the perfect phase coherence between Ch1 and Ch2 is kept even in any angle of two capsules. It is important to note that two microphone capsules in one body create an ideal stereo configuration because the actual physical design takes into account the effect of the microphone body itself, as opposed to two separate microphones which are not physically designed to work adjacent to one another. The CUW-180 provides ideal X-Y stereo recording of classical ensembles, guitars, brass, drum overheads, etc. The microphone is also well-suited for talk shows with two persons sitting face-to-face, providing fully independent level controls. Each signal is available through the standard AES configuration XLR-5M connector. For Surround applications, two CUW-180 are ideal for true four-channel recording, providing a conceptually simple method of recording both Front L/R and Rear L/R signals. In the Sanken Surround system, one microphone is used for front L and R, while a second microphone is used for rear SL and SR. The essential phase coherence for L and R is rigidly maintained, while allowing the front and rear dual microphones to be positioned for the particular situation. To add another source for a hard front Center channel, an optional mic holder is available, and Sanken offers a complete line of shotgun microphones which can be utilized for this purpose. Please look at the CUW-180 Surround System and its user's report.